The snarling beast… can’t you hear it growling out there? Listen! This town is like a wild animal in chains, Molly. It doesn’t fight back right away, it just lies there and snarls, waiting for a chance to pounce on you. The hero stalked by his past, living with the legacy of a reputation earned the hard way but not actively sought out, is a common enough theme in westerns. Generally, the inevitable confrontation with the past is undertaken only with the utmost reluctance, with the full knowledge that destruction rather than salvation may await. What’s less common though is a scenario where it’s the cumulative effects of times gone by that are addressed, and where aspects of those times are actually yearned for. A Lawless Street (1955) has such a concept at its heart – a man haunted not by misdeeds but by missed opportunities, and slowly being worn down by conscience, regret and just a hint of fear. Calem Ware (Randolph Scott) is the marshal of Medicine Bend, and was initially brought in to ensure this frontier town abides by the civilized values one of its leading citizens, Asaph Dean (James Bell), wants to see upheld. Ware is one of those itinerant lawmen sometimes referred to as town tamers, having worked some tough western settlements and built up a name for himself as a gunman of note in the process. One of the things I particularly like about the 50s western is the way such aspects of a man’s character or background are rarely glossed over or glamorized. The memorable opening scene has a lone horseman slowly ride along the empty main street, his body language and general demeanor suggesting he has something serious on his mind, and when the camera zooms in and focuses on his sidearm, then we know pretty well the exact nature of his business. This man is in town to settle a score with the marshal and word of what’s probably in store doesn’t take long to get around. Ware is the type who knows only too well the importance of maintaining a facade, he makes a big play of his apparent nonchalance, projecting an image of supreme confidence regardless of the danger that lie in his path, Yet the viewer knows this for what it is; the brief quote I added at the beginning is a line he lets slip to his landlady as she prepares breakfast for him before he sets off to do his duty. If we have any doubts though, it’s made clear when he returns to his office after the inevitable shooting – the stress of forever living in the shadow of violent threats and the debilitating effects of knowing he’s had to cut short another life are plain to see once he has closed the door against the prying eyes of the townsfolk. The local doctor (Wallace Ford) is aware of this, and says as much when he later helps to tend to Ware’s injuries after a bruising encounter with the dead man’s brother. The point here is that there’s a marked contrast between the private and the public face of Calem Ware, something that’s further explored when a musical star, Tally Dickenson (Angela Lansbury), arrives to put on a show at the theater. Ware and Tally have a shared past, a framed photo of her stashed in his room alludes to that early on, but its true nature is only revealed gradually. While much of the plot revolves around the machinations of a couple of businessmen (Warner Anderson & John Emery) who want Ware out of the way, and hire gunfighter Harley Baskam (Michael Pate) to that end, the heart of the picture is driven by the relationship between Tally and the marshal, and indeed the marshal’s own intrapersonal relationship. I don’t believe I’ve seen a film by Joseph H Lewis that wasn’t interesting, either in terms of theme or the visual language he employed in the telling. Although the plot of A Lawless Street isn’t especially original, the way Lewis goes about presenting it elevates it all considerably. Apart from one brief sequence, the entire movie plays out within the confines of Medicine Bend, with all the significant events taking place indoors. The director, and cameraman Ray Rennahan, creates a look and mood which approach film noir at some points and contain a fair amount of symbolism. The image above is, of course, a notable example — the wounded Ware hiding out in his own jail, the shadows of his past and his sense of duty pinning him in place just as surely as the shadows cast by the bars. Note too how the real man seems small and tense next to the solid and imposing image of himself. In fact, a great deal of this film is concerned with the concepts of illusion and reality; one of the main sets is the theater where Tally performs, and what is the theater if not a palace of illusion. As Tally plays her role on the stage, and the marshal assumes his watching from the box seat, the reality is only shown when they move backstage. In the same way, Ware’s office represents his “backstage”, the sanctuary which allows him to strip away the greasepaint of invincibility. Also, let’s not forget the notion of rebirth, the allusion to spirituality, which is frequently found in 50s westerns. The climax toys with the idea of resurrection, of a man back from the dead to reclaim his position in society, and by doing so attaining the spiritual and emotional equilibrium for which he’s been yearning. Randolph Scott has been featured on this site more than any other actor and I guess most of the reasons for his enduring appeal as a western lead have been covered in depth. For me, A Lawless Street is yet another step along the path Scott was treading in the post-war years, a path that would culminate in the iconic roles he played for both Boetticher and Peckinpah. The part of Calem Ware has enough depth to make it interesting, and Scott had acquired sufficient gravitas by this stage in his career to render his portrayal credible. Angela Lansbury has had a long and distinguished career but the western isn’t a genre that she’s had much association with. A Lawless Street is the only genuine example as far as I’m concerned, as The Harvey Girls is a musical first and foremost. I understand Ms Lansbury has been dismissive of the film and her participation in it, which is a bit of a shame. Aside from the fact the whole production has much to recommend it, her own role is a pretty good one with enough drama and internal conflict to give her something to get her teeth into, and of course there’s the opportunity to show off her singing skills in the theater number. Michael Pate, John Emery and Warner Anderson are a fine trio of villains: Pate gets across the cunning and menace of his character very successfully, and even outdraws Scott quite spectacularly, while Anderson and Emery are as slimy a pair of puppet masters as you could wish for. Wallace Ford is one of those character actors whose presence is always welcome, and he had a strong pedigree in westerns. As the town doctor, and Scott’s only true friend, he has a good share of screen time and is solid and reassuring throughout. Of the remaining support players, both Jeanette Nolan and Jean Parker deserve a mention for the sense of poignancy and pathos they bring to their small but pivotal roles. A Lawless Street has been available on DVD for many years via Columbia/Sony, and looks reasonably good. The 16:9 transfer could use a bit more sharpness and some minor work but it’s quite acceptable as it stands. In my opinion, this film is as near the top tier of Scott westerns as makes no difference. The theme, built around a standard genre plot, is rich and has the kind of depth which makes it a pleasure to revisit. The direction by Joseph H Lewis has the pace, the eye for composition and the stylistic flourishes that make his work a rewarding experience. When you factor in the mature and assured performance of Scott, who was very close to hitting his peak, then the result is a deeply satisfying film. All things considered, I give this movie my strong recommendation. On June 25 1876 Lt Col George Armstrong Custer led his famed 7th Cavalry into the valley of the Little Bighorn, and into the pages of history. Exactly how subsequent events unfolded have remained the subject of debate and conjecture to this day. What is certain is the result of that fateful engagement between Custer’s 7th and the enormous force of Indian warriors, largely Sioux and Cheyenne, ranged against them. Custer and his entire command were massacred, wiped out to a man. Over the years, that event has come to symbolize different things to different people: heroism, folly, retribution, or flawed judgement. A number of films have offered various interpretations of what transpired in the heat of battle, and a few have also turned their attention to the aftermath. 7th Cavalry (1956) is one of those movies that looks at what followed and, for a time at least, toys with the notion of saying something definitive about the actions of Custer. Ultimately though, it backs away from this – it’s essentially a film of two parts, with the potentially interesting beginning gradually giving way to a more familiar and standard outdoor adventure that’s nowhere near as satisfying as it could or should have been. The story is told from the perspective of Captain Benson (Randolph Scott), apparently one of Custer’s favourites, who is first seen returning to Fort Lincoln in the company of his bride-to-be, Martha Kellogg (Barbara Hale), shortly after the ill-fated Little Bighorn expedition. At this stage Benson is unaware of what has befallen his regiment, but the uneasy silence hanging over the fort as he approaches it alerts him to the fact that something is badly wrong. These opening scenes are eerily atmospheric, as we follow Benson through the deserted fort, and share in his confusion and sense of foreboding. And then the full, horrific truth is revealed – the overwrought widow (Jeanette Nolan) of one of the slain soldiers confronts Benson and tells him of the massacre and the ugly fate of those who fell, practically accusing him of cowardice and deception in the process. What follows is the return of the surviving units, the establishment of a board of inquiry and the airing of various recriminations. The inquest into this military disaster is to be conducted by the father of Benson’s betrothed, a stiff and uncompromising army man of the old school (Russell Hicks) who has always regarded his potential son-in-law with suspicion at best. This section is where the film is at its strongest, holding out the possibility that a range of themes, ranging from the classic one of redemption through notions of honour and class prejudice, will be delved into. Yet few of these, barring the former, are ever fully explored as the movie progresses. The second half sees the tone, emphasis and setting shift completely as the investigation winds up rapidly and Benson sets out on a suicidal mission to recover the remains of Custer and the other officers of his command. Here we retreat towards more standard fare as Benson picks a troop of “volunteers” made up of drunks and shirkers (Jay C Flippen, Denver Pyle, Leo Gordon, Frank Faylen et al) who also avoided the initial battle to undertake the perilous mission. Despite being weaker, this portion of the movie is not without its own points of interest, not least the introduction of the idea of spirituality. Sadly though, here’s another potentially fascinating avenue that’s left undeveloped and actually treated in a hokey fashion in order to facilitate a convenient climax. Over on his site on 50s westerns yesterday, Toby made a very good point when he mentioned Night Passage. If you follow that link you will see exactly what he was saying, and the essence of it is that the way we approach a film, or the weight of expectation that we bring along, can unfairly colour our assessment of it. It’s an idea that I’ve had buzzing around in my own head for a while too, and Toby’s reference to it made me wonder if it didn’t have some application to the movie in question here. What I mean is this: how far does one’s preconceptions based on cast, crew and subject matter impact on the evaluation of a movie? 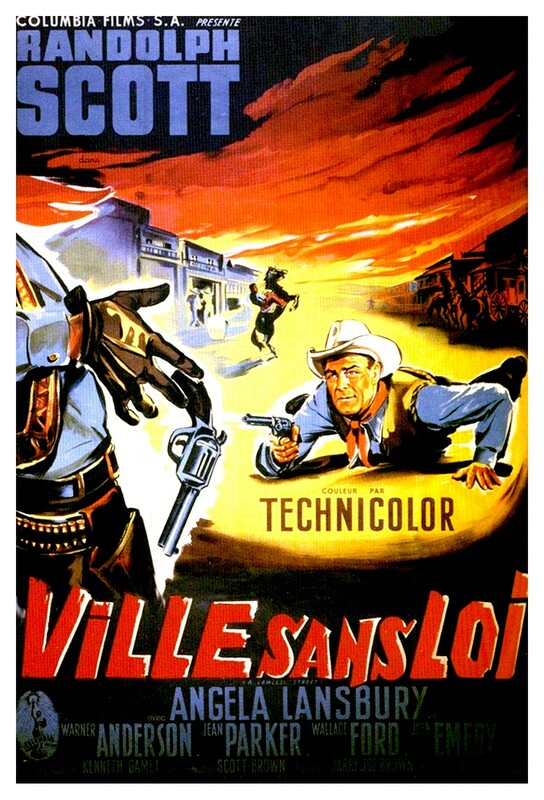 In this case, we have a mid-50s western starring Randolph Scott, directed by Joseph H Lewis, and dealing with one of the most controversial figures in western lore. I think all of these factors are bound to raise expectations in the minds of viewers, expectations on which the finished product doesn’t really deliver. Is that position fair though? On consideration, I think it is, or partially so at least. Lewis has a reputation for making tight and economical little B pictures that frequently transcend their modest production values and offer visual and thematic riches. I don’t think his direction is especially weak in 7th Cavalry, but the script, and its execution, tries to pack too much into a pretty brisk running time. There’s simply too much going on and too little time to expand upon any of it. Ultimately, we’re left with a first half that flatters to deceive, and a visually attractive follow-up (beautifully shot by Ray Rennahan) which leaves us short-changed. The specter of Custer hovers over proceedings throughout, and indeed helps effect a resolution which is far too pat for my liking. I do wonder if the film had had a director and star of lesser standing whether my overall reaction would have been different – I don’t know, but it is something to ponder. And back again to expectations. Randolph Scott made 7th Cavalry just as his collaboration with Budd Boetticher was about to see his iconic status within the western genre fixed permanently. It’s difficult to put that thought to one side while watching the movie but, in all fairness, Scott acquits himself well enough despite the shortcomings elsewhere in the production. Anyone familiar with this site will be well aware of my admiration for Scott, and the roles he took on in the latter stages of his career are easily my favorites. No one ever played pride on screen quite so effectively as Scott, and that aspect forms the cornerstone of his portrayal of Benson. His quiet dignity and innate self-confidence are to the fore as he plays a man whose motives and character are called into question by almost everyone – it’s not quite the conflicted loner that he and Boetticher would so successfully explore but it’s not a million miles away either. As the principal female lead, Barbara Hale is fine, yet the role is limited in scope and offers her few opportunities. The supporting cast in the film is particularly strong – Jay C Flippen, Frank Faylen, Leo Gordon, Denver Pyle and Jeanette Nolan all have their chances to shine and deliver telling little performances, with Faylen and Flippen getting the more interesting and rounded roles. I also want to take this opportunity to mention the small (yet pivotal in terms of the plot) part played by the recently deceased Harry Carey Jr. Over the years, his presence contributed a lot to so many films, especially westerns, and his passing sees yet another link to the golden age of cinema severed. In 7th Cavalry, as in so many movies, Carey displayed an honesty and simplicity that always helped ground a picture and added a certain warmth. 7th Cavalry is one of those films that has been hard to get hold of in an acceptable edition on DVD. There are a number of options available, but most are problematic in one way or another. There’s a French release by Sidonis that reportedly sports a fine transfer but forces subtitles on the original soundtrack, there’s a UK disc that I understand is of appalling quality, and there are no fewer than three editions in Spain. Of those Spanish releases, two are either full frame or non-anamorphic letterbox transfers. The one to go for is this edition by Regia Films, which sees the movie paired up on separate discs with another Lewis title Terror in a Texas Town. The disc has a good anamorphic widescreen transfer, with subtitles which can be deselected via the setup menu. The print used is in pretty good condition, without any noticeable damage, although the colours can appear slightly muted on occasion. In the final analysis, I’d have to say 7th Cavalry is a middling western; there is the promise of something different that’s never fulfilled, and that’s what I find most disappointing.